There, I said it; "Please, Don't clip your fingernails in church". I never thought I would share that thought online but today was the day and I felt it appropriate, and perhaps needful, to give a reminder about the sacredness of Sacrament Meeting and how we might look at our understanding of and behaviors during it. For many years I've been aware of people doing things in Sacrament Meeting that were not in keeping with the teachings of the Brethren. But, as we are all learning and growing, we strive to 'teach correct principles' and then be patient and kind with one another in our foibles and growth. Yet, I think that a blog post may do some good - in teaching and helping those who may not be aware or thoughtful of those around them and how their behaviors affect others'. My ears are attuned to sharp noises (an inherited family trait) which has caused me a great deal of grief over the years. But, I've learned coping mechanisms and how to forgive those around me who were unaware that their gum chomping or snapping etc. was sending me through the roof on the inside, even as I was looking calm on the outside (a LOT of prayer to overcome this challenge). When I was a youth, nearly each Sunday, I knew exactly where Brother W. was seated because, without fail, after the opening prayer, he'd get out his clippers and start on that part of his personal hygiene. I knew this was not appropriate and wondered how or why he felt it was. Yesterday, as Sacrament Meeting began, I became aware of a woman seated not too far from me who began to clip her nails after church began. Again, I wondered why people would find this to be suitable at church, or, if they just didn't think of it at all. So, in that regard, and as a sister in the faith, may I just suggest that we each check ourselves as to our Sabbath behavior and how we might each improve? (myself included). Back scratching and how it affects those behind you with that constant movement. Running fingers through your boyfriend or girl friend's hair; distracting to those seated behind you. Texting or playing games on phone. We've been instructed sufficiently on that from the brethren. Wearing Perfume to Church. I know of several people who are so sickened by perfumes that they can't attend church or the Temple. This seems to be a growing thing in our society with so many chemicals and so many becoming more and more ill. Let us be sensitive to them, please. Modesty; a very big challenge in most of the wards we've been in. My girls have struggled with the immodesty of so many youth and, one day, my then, 17 yr. old son, asked to be excused from Sunday School because of the extremely short skirts of several of the girls in the class that day. I excused him and felt it the right thing to do that day. And, I was really proud of him for being willing to ask me and let me know it was a difficult issue for him that day. Yes, we are all works-in-progress, trying to overcome and dealing with our own unique set of challenges and issues. But, these things I've listed are not difficult to do. They show respect for our Savior and Redeemer whom we go to Worship, and they show respect for those around us who are trying to be reverent, renew their sacred covenants with the Lord, and receive answers to their sincere prayers. 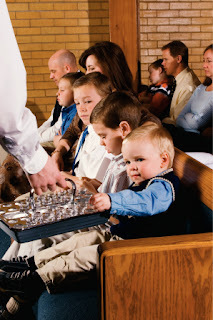 Here's a great article with additional insights: Electronics in Church?